On 28 December IG reported continued anomalous seismic activity at Cayambe characterized by volcano-tectonic and long-period earthquakes located 2-8 km below the summit. As many as 40 earthquakes had been recorded each day for the previous two weeks and starting on 24 December that number again increased, especially for volcano-tectonic events. A swarm on 27 December consisted of 100 small-magnitude events. A strong sulfur odor persisted, and cracks in the glacier near the summit that climbers has recently reported were visible during an overflight. In addition, deformation on the flanks was detected in GPS data. During 2004, Cayambe's seismicity increased three times, on 25-31 January, on 25 February-5 March, and on 4-12 October. Our previous report on Cayambe discussed events through November 2003 (BGVN 28:11). The first seismic swarm began on 25 January 2004 when the number of volcano-tectonic (VT) earthquakes increased, with seismic activity occurring in bands lasting 2-3 hours. The events were small in magnitude and were located ~ 1-4 km below the SW flank. At 1934 on 27 January, a magnitude 3.4 earthquake was recorded. On 29 January, the activity peaked with 148 earthquakes reported. Seismicity thereafter decreased to normal base-line levels. The second earthquake swarm began on 25 February with an increased number of VT earthquakes. Like the January events, these earthquakes were of low magnitude. The largest event occurred on 29 February at 1059 measuring M 3.1. The events were localized primarily below the E flank with peak activity on 2 March, when 271 earthquakes were registered. The energy released by this cluster was far larger than the one in January and was almost comparable to activity in March 2003 (figure 2). Figure 2. The total number of earthquakes each day at Cayambe during 28 December 2002 through early January 2004. The spike in daily earthquakes seen during late March 2003 (up to 330 per day) was discussed in BGVN 28:11. A spike about half that size occurred in late January 2004. Courtesy of the Instituto Geofisico. On 12 March, a small increase in activity was recorded, and on the morning of 15 March, a M 3.6 earthquake was recorded on the S flank. Residents reported no felt earthquakes. On 4 October, there was a slight increase in the number of events registered with a total of 18 events, 17 of which were hybrid events. At 2333 on 6 October a M 3.4 event was recorded. These earthquakes were located in the S zone of the volcano edifice. Two seismic swarms on 8 October consisted of 177 VT earthquakes. The first swarm registered at 0500 and lasted an hour. The second swarm began at 1130 and lasted approximately 9 hours. Some of these events were located in the SW flank. After the seismic anomalies on 4 and 6- 8 October, activity returned to normal base-line levels. Apart from the swarms between September and October, the seismicity appears to have changed, with the number of VT events diminishing by one-half in relation to those previously recorded, whereas the number of hybrid events tripled. Later, long-period LP events were again observed, which is characteristic of this volcano returning to normal levels. The internal seismic activity at Cayambe is characterized by the generation of 10 events per day on average. Nevertheless, this type of activity has alternated with sporadic seismic swarms consisting of hundreds of events lasting several days, after which activity returns to the base-line level. These types of seismic swarms were recorded in December 2002, March 2003, and in January, March, and October of 2004 (figure 3), with similar characteristics and averaging 2 days in duration. Scientists inferred the cause of the observed seismicity as related to motion of fluids in the interior of the edifice. Thermal images obtained during 2004 did not contain anomalies. Figure 3. The total number of earthquakes each day at Cayambe during 2004 (tick marks along x-axis are every 14 days). The record was punctuated by three strong increases in seismicity, during late January, during February-March, and during October. The spike in daily earthquakes seen during February 2004 neared 300 earthquakes per day. Courtesy of the Instituto Geofisico. During 16-18 September 2005 a short seismic episode occurred with earthquakes on the SW flank, ranging from 135 to 330 events per day. The earthquakes reached a maximum magnitude of 3.6. Information Contacts: Instituto Geofisico (IG), Escuela Politécnica Nacional, Apartado 17-01-2759, Quito, Ecuador (URL: http://www.igepn.edu.ec/). A cluster of earthquakes that had been recorded at Cayambe since 16 September, with about 300 small earthquakes occurring during 16-18 September, decreased in number significantly after 19 September. During 19-25 September, an average of 5.3 earthquakes occurred daily. During 16-18 September, a cluster of 330 small earthquakes occurred at Cayambe. The earthquakes reached a maximum magnitude of 3.6. They occurred on the volcano's SW flank, where previous clusters had been located. The cluster had not reached the level of one that took place in March of 2004. IG reported that these types of clusters occur fairly regularly at Cayambe and could be related to changes in the internal pressure of the volcano. The earthquakes continued through at least 19 September. On 29 January a swarm of ~148 small volcano-tectonic earthquakes occurred at Cayambe. By 1 February seismicity had decreased, reaching "normal" base levels. IG reported that the swarm may have represented an increase in the internal pressure of the volcano due to the arrival of fluid, possibly magma. During 3-9 November, about nine earthquakes occurred per day at Cayambe, near the daily average since August 2003 and about twice the daily average of 4 per day before that. Seismicity also included small clusters of tectonic earthquakes with magnitudes less than 3. There were reports of a strong scent of sulfur in the sector of Picos Jarrína at an elevation of ~5,460 m. The scent was strongest near cracks. This report largely discusses seismicity at Cayambe during January-October 2003 (figure 1). On the whole, the numbers of daily earthquakes remained fairly constant at low to moderate levels (typically fewer than 25 earthquakes per day). On six days the number of daily earthquakes approached 50 or greater (1 January, 15, 28, 29, and 30 March, and 1 April). Epicenters were concentrated on the SW flank, similar to the pattern in December 2002. During the year, residents did not report feeling earthquakes at Cayambe, but did notice sulfurous odors. Although some seismic signals had an uncertain origin, others were interpreted as related to magma movement. Figure 1. The total number of earthquakes each day at Cayambe between 1 January and 27 October 2003. Courtesy of the Instituto Geofisico-Escuela Politecnica Nacional, Ecuador. Observers saw no changes at Cayambe during January, although strong sulfurous odors were reported early in the month. Very low seismicity prevailed, with an average of five earthquakes per day during the second week in January. In general, the earthquakes registered since 2 January 2003 were long-period earthquakes; a few hybrid events and fracture events also were recorded. Some small volcano-tectonic (VT) earthquakes registered. On 31 January, following a week of low to moderate seismicity, two larger earthquakes were recorded: the first under the volcano, M 3.9; the second to the E, M 3.5. Neither earthquake was felt by area residents. Associated, small long-period (LP) earthquakes also registered, although the late-January daily totals were still low to modest. Following this activity, seismicity dropped and generally remained low through February and early March. On 8 March an M 3.6 earthquake triggered about 2 hours of small VT earthquakes beneath Cayambe's S flanks. Seismicity again dropped to low levels until 14 March when there was a small cluster of shallow VT earthquakes lasting about 1 hour. These events were under M 2, and afterwards seismicity dropped to background levels. The high for the year occurred during 24-30 March when earthquakes peaked at approximately 335 per day. Clusters of events were noted. Those on 27 March included an M 3.9 earthquake, and those on 29 March included two M 3.6 earthquakes. The events were located at 5-6 km depth below the SW flank. This was the same area in which seismic clusters occurred during December 2002. There were 99 earthquakes counted on 31 March. None larger than M 3, they consisted of up to 95 VT and four hybrid events. In early April seismicity again dropped to low levels, increasing slightly in the second week of the month. The recorded LP and hybrid events registered were thought likely related to fluid movement inside cracks. Small VT earthquakes were recorded on 13 April; otherwise, seismicity remained low through the rest of the month. The smell of sulfur was noticed during a 14-20 April visit, but no other changes were noted. Seismicity remained low throughout May, with only occasional VT, LP, and hybrid events. Seismicity increased slightly in early June, but still remained close to background levels. A new signal appeared at the Refugio station, characterized by high frequency at the beginning and a very long coda (tail). Thereafter, activity dropped and remained low for the rest of June. A series of VT earthquakes occurred during the first week of July; the maximum activity was on 1 July, with 16 events. Nevertheless seismicity remained near background levels, and stayed low until early August. A VT earthquake occurred on 4 August beneath the W flank; on 6 August seismicity increased slightly and was characterized by hybrid events. Activity was low through mid-August. A series of VT events related to rock fracturing occurred between 18 and 31 August; the majority occurred on 22 and 25 August, with events reaching M 3.5. These events beneath the SW flank were similar to the spike in activity in March. Activity dropped again during the following month. For the last week of September, seismicity was still at background levels. A single VT event registered, with a magnitude of 3.2, located beneath the volcano at a depth of 4 km. As with the previous cases, the event was too small to be felt by area residents. Between 13 and 19 October, seismicity generally remained normal, but on 15 October, a small cluster of VT earthquakes occurred S of the crater. On 23 October another small cluster of VT earthquakes (M <3) was recorded beneath the SE flank, in a part of the same zone as the events of the previous week. Over these weeks the base seismicity level seemed to increase slightly (figure 1). During 3-9 November, about nine earthquakes occurred per day, near the daily average since August 2003 and about twice the daily average of 4/day before that. Seismicity also included small clusters of tectonic earthquakes with magnitudes less than 3. There were reports of a strong scent of sulfur in the vicinity of Picos Jarrína at an elevation of about 5,460 m. The scent was strongest near cracks. The massive compound andesitic-dacitic Cayambe stratovolcano is located on the isolated western edge of the Cordillera Real, east of the Inter-Andean Valley. The volcano, whose southern flank lies astride the equator, is capped by extensive glaciers, which descend to 4200 m on the eastern Amazonian side. The modern Nevado Cayambe, constructed to the east of older Pleistocene volcanic complexes, contains two summit lava domes located about 1.5 km apart, the western of which is the highest. Several other lava domes on the upper flanks have been the source of pyroclastic flows that reached the lower flanks. A prominent Holocene pyroclastic cone on the lower E flank, La Virgen, fed thick andesitic lava flows that traveled about 10 km E. Nevado Cayambe was recently discovered to have produced frequent explosive eruptions beginning about 4000 years ago, and to have had a single historical eruption during 1785-86. Samaniego P, Eissen J-P, Monzier M, Robin C, Alvarado A, Yepes H, 2004. Los peligros volcanicos asociados con el Cayambe. Corporacion Editora Nac IG-EPN, IRD, 94 p.
Samaniego P, Martin H, Monzier M, Robin C, Fornari M, Eissen J-P, Cotten J, 2005. Temporal evolution of magmatism in the Northern Volcanic Zone of the Andes: the geology and petrology of Cayambe volcanic complex (Ecuador). J Petr, 46: 2225-2252. Samaniego P, Monzier M, Robin C, Hall M L, 1998. Late Holocene eruptive activity at Nevado Cayambe volcano, Ecuador. Bull Volcanol, 59: 451-459. There is no Deformation History data available for Cayambe. There is no Emissions History data available for Cayambe. 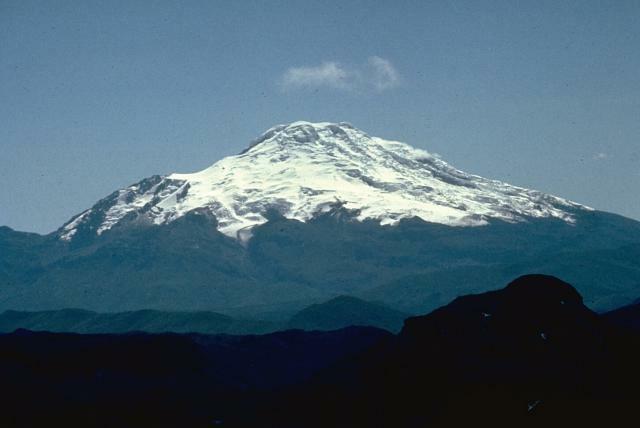 The massive compound Cayambe stratovolcano, seen here from the SW across Ecuador's Interandean Depression, is the northernmost of a chain of large, glacier-covered Holocene volcanoes along the western edge of the Cordillera Real. No historical eruptions are known from 5790-m-high Cayambe, although lava flows on the flanks of the volcano have very young morphologies. Pyroclastic-flow deposits of possible Holocene age are present. There are no samples for Cayambe in the Smithsonian's NMNH Department of Mineral Sciences Rock and Ore collection. Large Eruptions of Cayambe Information about large Quaternary eruptions (VEI >= 4) is cataloged in the Large Magnitude Explosive Volcanic Eruptions (LaMEVE) database of the Volcano Global Risk Identification and Analysis Project (VOGRIPA).